Lawyers in Narrows, VA | Warren & Scheid, P.C. 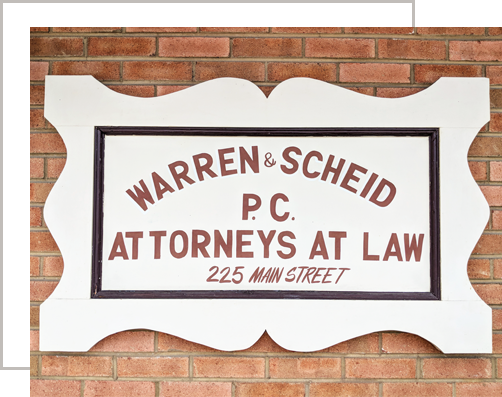 In 1937, the late James L. Warren founded what is now Warren & Scheid, PC. With a dedication to serve his community, Mr. Warren worked for decades representing clients across the New River Valley. In 1997, Brian T. Scheid took over the firm’s operations, striving to continue Mr. Warren’s legacy of serving the people of the New River Valley. If you or a family member find yourself in need of legal representation call the Narrows, Virginia law firm of Warren & Scheid, at (540) 726-2357. We are passionate advocates for our clients – assessing, litigating, and trying criminal cases of all types. We have aggressive and experienced attorneys who will protect your rights and guide you through all your options. We offer advice and assistance to our clients who need help with civil, business, and commercial litigation. We pride ourselves in providing client centered representation for you and your family. We want our clients to be comfortable during all phases of their purchase or sale of real estate. Working with a skilled, experienced attorney who is dedicated to helping you is your best first step to recovery. Our firm is here to assist you or your business during the best and worst of times. Whether you need representation for criminal charges, real estate transactions, contractual disputes, or personal injury, we have the experience to assist you in navigating the confusing process. Our firm prides itself in client-centered representation, making sure you are always apprised of the status of your case and have access to your attorney. When people hire our firm, they receive the experience and knowledge of our entire staff. Each member of our team has developed highly effective skills and brings knowledge that can help us deliver the positive results our clients deserve.